Fashionable heels and flip-flops..... graduation. Footwear for formal occasions found everywhere these days; the entire spectrum from flip-flops to the highest heels (how do they walk in those things), although I don't see any "sensible shoes" among the bunch. Reflections of summer trees and fluffy white clouds against the blue of the sky; but wait, is it really the blue of the sky or the blue of the cold water in the still pool? Is this any way to study the sky? Why, of course! 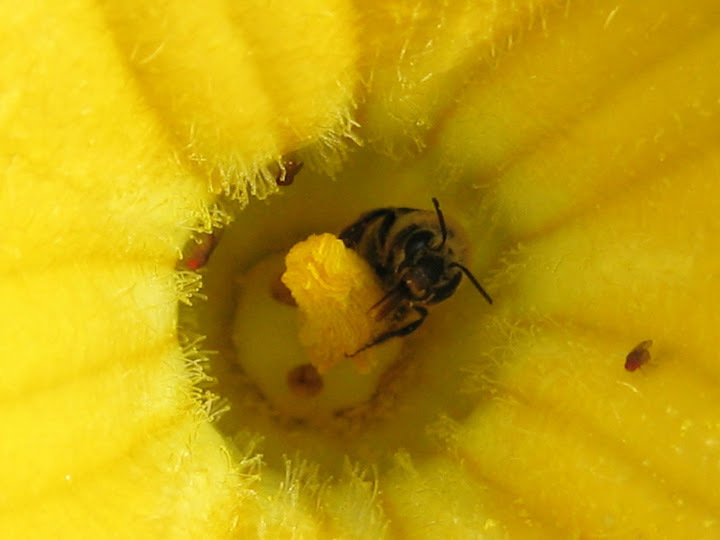 A bee's eye view.....pumpkin flower. Busy buzzing bee go about your business and pollinate the pumpkins please. And dear fruit flies stir memories of college days and hours (many, many, many hours) of red eyes or white eyes, short wings or long wings, bristled abdomens or smooth; of crossings and larvae and pupae and counting and counting and counting (endless counting), all in the name of Genetics. 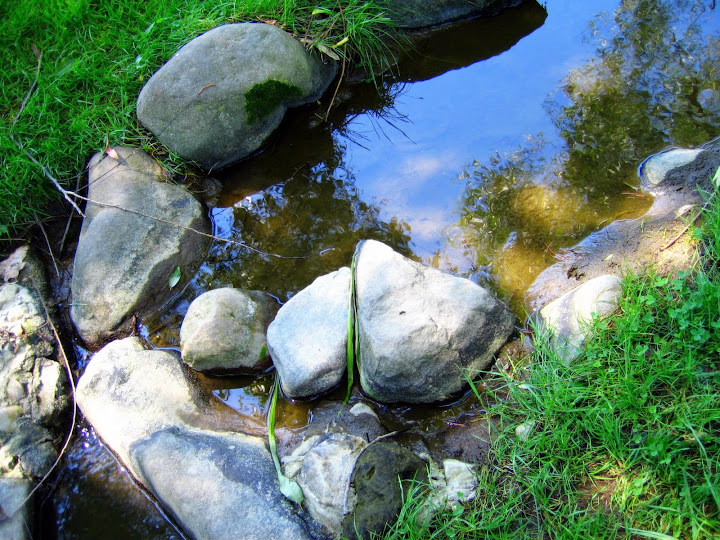 You are much better suited for this environment. And the Saturday Photo Hunt theme this week is? "Looking Down"
Saturday Photo Hunt: "Looking Down"
gorgeous takes on the theme!! I love the photo of all the flip flops, oh how times have changed! What a great (and varied) collection of shots for this week's theme. The close-up of the bee is particularly stunning . . . I wish I could take close-ups like that! Great take on the PhotoHunt theme. Love the photo of the bee! I LOVE these pictures!!! I know we should always look up, but as I get older, I have to keep looking down to save my own neck! Nice to know I can see things like this! Was that a grad photo? I thought I recognized black graduation robes! Those high heels are scary! Mom would break her neck!! That bee photo is amazing!! non dress shoes on when the got out of high school. haven't even seen a bee this year. our healer was just abandoned here and was skinny, cold, and scared. These are all wonderful shots. I love the perspective in the first shot and the reflection is great in the second. great series of pictures. the reflection in the second shot is superb. great shots! I especially like the last one. 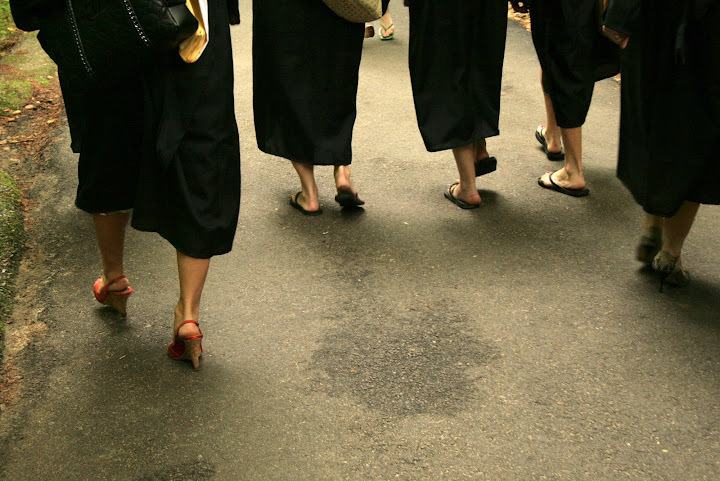 thought graduation ceremonies are formal, i wonder why somebody's wearing flipflops..happy photohunting! Lovely flower photo and the pond looks peaceful. Very observant look downward! Your reflected sky is a great shot! I never could decide what the best shoe to wear with a graduation gown might be. Flip flops seem so casual for it and stilettos seem to fancy. In the first picture I first thought they were nuns, lol ! But then I had some doubts. Love the last picture it's just gorgeous ! Great shots! Love the bee in the flower. What a great set of images on "looking down." Definitely a variety of footwear in the first image, and I like how the reflection has us "looking up by looking down." I took pictures of our town's graduation on Saturday and was shocked at how HIGH some of the heels were that the girls were wearing. I was also pleased that some chose flats. All are great photos. The bee shot is awesome! Look Who Already Showed Up On My Milkweed!! !